During Prohibition, Al Capone got moonshine from many different places. But the shine he liked the most came from Golden Pond, Kentucky. What made Golden Pond shine so special? Casey Jones. Casey was Golden Pond’s master stillmaker. The stills he designed were unique and meticulously crafted. Revenuers could tell a still was Casey’s just by looking at it. Fellow moonshiners and Chicago’s most famous gangster knew Casey’s stills by the superior product they produced. Prohibition-era moonshining wasn’t for the faint of heart. Stills were often in remote, hard-to-reach locations. When revenuers sniffed out a still, they relished busting it up so the equipment couldn’t be reused. AJ learned everything he knows about moonshine from his grandfather, the legendary Casey Jones. The law finally caught up with Casey Jones resulting in a 2-year stay at Mill Point Federal Prison. AJ built our still by hand to be a precise replica of one of his grandfather’s masterpieces. The day we pulled the first run off the still was a dream come true for AJ. For over 30 years, Casey Jones built stills all over Kentucky using only copper. He refused to use steel, even though it was cheaper, because it was coated with potentially lethal zinc. He was a near-magician at knowing exactly how much and what gauge copper a certain size still would require. With just a torch, a hammer, snips, crimping pliers, and a soldering iron, Casey built 3-piece stills that were easy to set up and easy to move. He charged around $20 (about $350 in today’s dollars) and a gallon or two of the product, of course. Our Casey’s Cut Moonshine is named in honor of Casey and his preferred method of payment. Moonshiners often grumbled and complained that coil condensers couldn’t produce enough whiskey to meet demand, but had no remedy. Casey was the man who created a cylindrical condenser that made a higher-proof, better-tasting product in half the time. During a time when the woods were crawling with axe-wielding revenuers, this invention proved very popular. And unlike still-makers in other parts of the country, Jones preferred rectangular mash cookers. His square pot still, also known as a coffin still, fit perfectly in the bed of a wagon or a pickup truck, a definite plus when a moonshiner needed to make a fast getaway and didn’t want to leave the tools of his trade behind. Casey also put handles on his stills in all the right places so they would be easy to move. He recognized that the condenser was the most important piece of the still, so it had its very own handle so that in case of a raid, it could be the first piece out. Casey built stills in just about every hollow in the Land Between The Rivers (now known as the Land Between the Lakes.) He even built one directly across the Cumberland River from the Kentucky State Penitentiary in Eddyville. He was finally sentenced to two years in prison for bootlegging. When he was released from Mill Point Federal Penitentiary in West Virginia, the king of the still-makers finally retired. Our square copper pot still is the heart of our distillery. 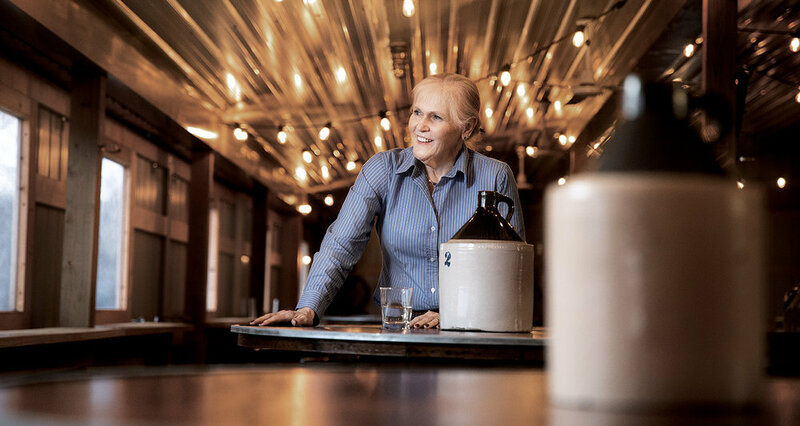 If AJ is the Master Distiller, his wife Peg is the master of everything else. John Heyser pours the tails of the previous run into the pot to give our moonshine an extra kick. Casey’s legendary ingenuity and passion inspired his grandson Arlon Casey Jones to follow in his footsteps. Casey built his last still in 1967. AJ used that still, which is on display in the Casey Jones Distillery Lounge, as a guide to build the still we use today. 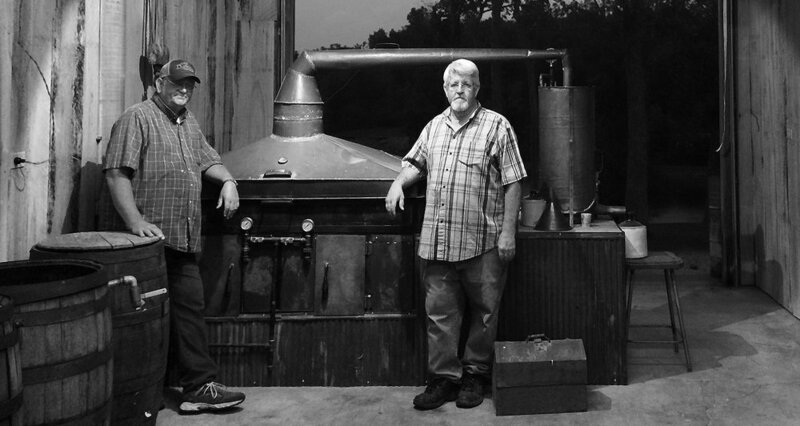 As our Master Distiller, AJ handcrafts every batch of Casey Jones Moonshine using a recipe that has been handed down through generations of the Jones family. A family recipe cooked in a family still – it doesn’t get more authentic than that.